Mid America Logistics is a full-service logistics company driving the best people and best technology with a dedicated passion for service. We have a massive network of high-performance partners and our own in-house written software, making us the easiest company to do business with – hands down. Driven by success. A better experience. 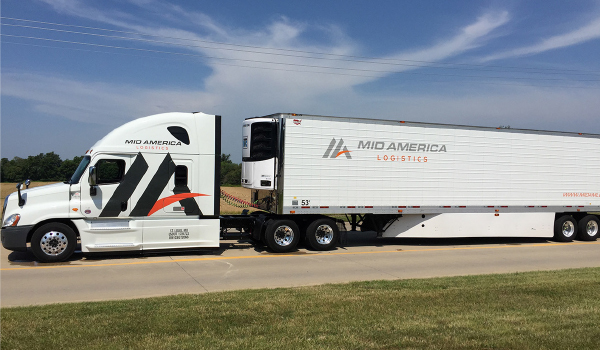 Mid America Logistics was founded in 2007 as an asset-based temperature-controlled trucking company servicing the flower industry. Since inception the company has evolved into a full-service trucking, logistics, and technology development company. The company is based in Saint Louis, Missouri with offices in Charlotte, NC, Jacksonville, FL, Cincinnati, OH, Phoenix, AZ, Rogers, AR, Spokane, WA and Guadalajara, Mexico. They are one of the fastest growing Midwest based providers of Full, Partial and Less Than Truckload capacity in the CPG, Retail, Agriculture and Automotive industries, growing from $24M in 2014 to over $110M in 2018. Mid America Logistics services the entire 48 contiguous United States, Canada and Mexico. It operates 24 hours per day, seven days per week with full capacity. It has preferred delivery status and experience in TSA controlled, government and free trade zones allowing for more reliable transit to and from ports of entry. It is also one of the few third-party logistics firms offering the ability to offer time specific pickup and delivery times through automated scheduling. Mid America has developed a proprietary real-time secure SQL platform allowing for rapid development of supply chain execution services. They have utilized class leading market data allowing for predictive fuel and market index pricing of shipping corridors to optimize routing, transportation procurement and cost optimization. Mid America’s development team has developed redundant mobile and text tracking solutions for real-time location, asset performance, truck diagnostics and driver behavior evaluation. The proprietary technology has a full suite of connectivity options such as EDI and API. Mid America offers its clients Complimentary Shipper TMS Licenses on a non-exclusive basis to perform full reporting, procurement, tracking, tendering and execution with both Mid America and other carriers. Mid America Logistics operates under a culture of safety across all divisions of the business. It conducts regular Safety Audits both internal and third parties. Furthermore, they utilize Electronic Driver Logs for both drivers and developed technology to detect non-compliance with its carriers. Within the logistics division, it executes automated insurance compliance and matches VIN # tracking for all carriers to eliminate any chance of double brokerage. All employees attend scheduled safety meetings and training in all company meetings.